(BPT) - A great way to start your day is to add breakfast to your morning routine. But as we all know, routines can get dull fast, especially after you’ve been eating the same breakfast for a few months. If you find your family is in a breakfast rut, it may be time to switch things up and add some excitement to those early hours. Get the whole family to cook. Getting everyone in the family to help out in the kitchen is easy, especially on weekends, and they’ll love feeling more involved. The next time you make breakfast, ask your kids to help you. Enjoy connecting as a family and building memories you will all cherish for years to come. Set up a pancake bar. Make a weekend breakfast extra special by setting up a short-order pancake station in your kitchen. Offer different flavors of pancake mix, set out chocolate chips, sliced fruit or any other ingredients to create special pancakes that appeal to your family. Don’t forget to top each pancake with a pat of butter or a dollop of whipped cream and, of course, warm syrup. 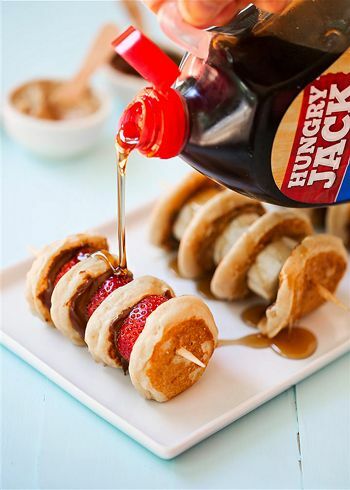 If you use a microwavable syrup bottle, like Hungry Jack, you can microwave the whole bottle and pour hot syrup straight onto your pancakes with no mess. Do your kids complain about having to eat the same thing every day? Surprise them with a special breakfast lottery. Have ingredients on hand for several breakfast entrees, like pancakes, waffles, or crepes. Put the names of each breakfast item in a hat and make whichever one you draw. This makes for an entertaining and suspenseful breakfast. When it comes to breakfast kabobs, the possibilities are endless. Mini pancake kabobs are a lively twist on a classic breakfast. 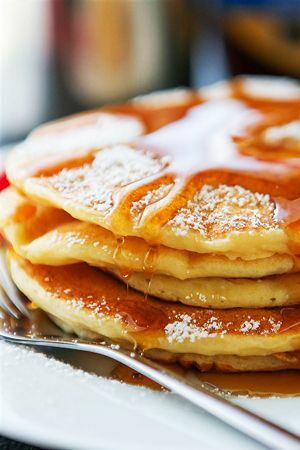 All you need for this recipe, courtesy of I Heart Naptime Blog, is a pancake mix, like Hungry Jack Complete Buttermilk Pancake and Waffle Mix, syrup, kabob skewers and your favorite pancake toppings. Cook small, cookie-sized pancakes on a griddle. Then, stack them on skewers with toppings like fruit and peanut butter. Top each kabob off with a drizzle of warm syrup. In a medium sized bowl, stir pancake mix, water, ricotta cheese and lemon zest together until mostly smooth with a few small lumps. Fry on a lightly greased nonstick skillet until golden brown. Serve with powdered sugar and warm syrup. Start your day with a satisfying breakfast while enjoying the company of your loved ones. Get creative and try some of these ideas for a whole new take on the first meal of the day.